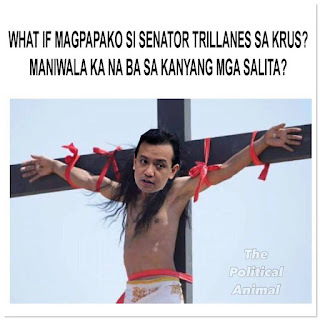 Satirical News: Senator Antonio Trollanes IV To Be Appointed As Assistant Secretary Of The Department Of Energy! 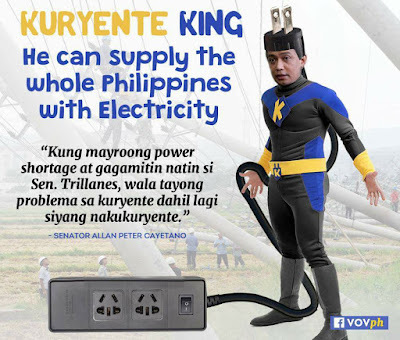 After an exchange of tirades, Senator Allan Peter Cayetano soon said, "If there's a power shortage then let's use Senator Trollanes. There's no problem with electricity because he's always electrified." Energy secretary Alfonso G. Cusi at first wanted to object to appointing Senator Antonio Trollanes to the position but later accepted. "I wanted to reject Trollanes as my assistant secretary but now I see the purpose. He's always been electrified or electrocuted. Just think how much we can save on power generating. We can have alternative energy sources such as the wind or the sun. Trollanes himself will be part of the alternative energy sources program." said DOE Secretary Cusi.